It is time for an effective and durable policy response to the current ‘migration crisis’ in Europe. Such a response, however, requires a better and broader understanding of what drives people to migrate in the first place. There is much debate about their motivations, and about possible solutions to the ‘crisis’ – debate that often leads to conflicting messages and theories. To shine a light on this issue and provide some clarity, the Overseas Development Institute (ODI) has used a Rapid Evidence Assessment (REA) approach to assess the quality of the evidence that is already available to identify what drives migration to Europe. Despite inconsistencies in the statistical data on irregular migration, there is no doubt that the number of people trying to come into European countries through irregular means soared in recent years, driven by a combination of conflict, political instability and economic insecurity. The evidence reveals that the asylum-seekers and economic migrants often have similar reasons for choosing to make the dangerous journey to Europe and one person may fall into both of these categories at the same time. One common and crucial motivation is their search for a secure livelihood. Measures that aim to allow asylumseekers in, while restricting the entry of economic migrants, overlook the reasons why a particular person migrates, and are likely to increase irregular migration still further as migrants seek alternative – and often more dangerous – ways to reach European countries. The data show clear patterns in the routes and nationalities of those entering Europe by irregular means, but it is hard to predict the route of any single individual, and a person’s motivations and plans may often change during their often long and convoluted journey to Europe. The fact that refugees can be motivated by the need for a secure livelihood in their decision to migrate to Europe in no way discredits their claim to refugee status as a protected category of persons under international and domestic law. Rather, this review finds that tightening migration policies and discriminating against other migrants on the basis of what are deemed to be ‘more genuine’ motives, seems both ineffective and unfair given the complexity of people’s choices to migrate at different stages of their journeys. The growing professionalisation of the people smugglers and the greater availability of information via the internet and social media also appear to facilitate migration. As a culture of migration from a particular country grows – as seen in Senegal, Morocco and within particular ethnic communities – local and international networks become stronger, encouraging further migration and providing vital information and resources for the journey. Policies that do not recognise the complex and changing nature of irregular migration are unlikely, therefore, to effectively address the difficulties faced by both migrants and governments in the current crisis. While tightening border security may change migration patterns and routes, migration policies alone are unlikely to influence the volume of people migrating. A person’s need to leave their home – or flee from it in the face of extreme danger – is likely to be far more important to their decision to migrate than the lure of another country’s welfare, migration and asylum policies. Two major factors are often cited as shaping people’s decisions to migrate: personal and political security, and the quest for a secure livelihood. However, one person’s motives may change in nature and in importance during their journey, suggesting that categorising individuals as ‘economic migrants’ or ‘asylum-seekers’ does not reflect the complex and fluid reality of people’s experience of migration. 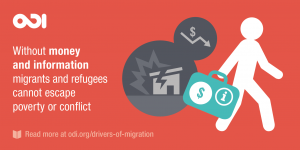 Any policy or programme that aims to influence current flows of irregular migration has to be based on a thorough understanding of the different factors that motivate people to move, the relationship between the options for regular and irregular migration, and the role that social networks and information sources play in determining who is migrating, where and how. International and national policies, economic conditions and political situations may all play a part in determining whether a person of a particular nationality migrates. Other factors relate to that person’s own circumstances – particularly whether they have the funds for the journey, as well as any intention to undertake it – and their local and wider social network, all of which can either encourage or prevent their migration. Studies on the influence of different countries welfare and asylum support systems suggests that they are not important to a person’s initial decision to migrate. However, the policies and rules of different destination countries may influence later decisions on whether to continue to another country where opportunities and conditions may be better. There is strong evidence that while tightening border security may change migration routes, and often results in more people making more dangerous journeys, migration policies are unlikely to influence the actual number of people migrating. L’UE en fait-elle assez pour éviter les décès de migrants en mer ? 4 dec 2013, Paris. Journée d’études sur les familles transnationales et sur les migrantes philippines. 12,13,14 dec, Paris. Colloque : La migration prise aux mots, mise en récits et en images des migrations transafricaines.